No indigestion & You’ve never heard it like this before…. She got stickers for using the Bible verse card pictures to say all three verses. 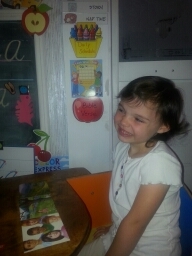 Bible time verses, but her own personal prayer life has increased. 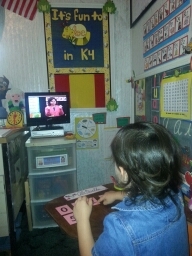 After listening to other children on the DVD program pray during Bible time and receiving instructions and examples from Mrs. Wasser on how we can/should pray for our friends, country, President and thank God for our food, belonging, others, etc., she is now stepping away from her typical little prayers and expanding her conversation with the Lord as she talks to Him – what a precious blessing to witness! 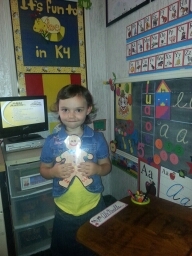 She followed Mrs. Pintar’s exact instructions with the paint and crayons. racking my brain as to what kind of incentives I could used to get her to complete the K4 papers. However, since day one, she has willingly listened to Mrs. Pintar’s instructions, and actually ENJOYED completing her papers. She is holding her crayon correctly, of which she was not managing well earlier, and she loves repeating with Mrs. Pintar, “Daddy says ‘Buckle up,’ Mommy says ‘I love you,’ and the children say ‘we will obey’,” as they remember where all of their fingers should be positioned. She is becoming quite the artist! Listening and working with number cards. 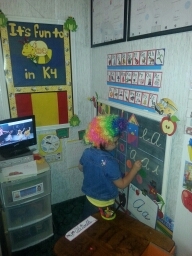 completes everyday’s required lessons and waits with great anticipation outside our classroom while Mommy transforms the visuals, chalkboard, and prepares for the next day. 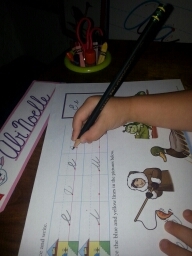 This week, AbiNoelle had her first opportunity to write her letters on her own without tracing. That’s a big deal! 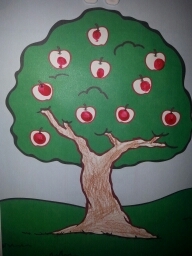 First she traced, then she wrote it by herself! 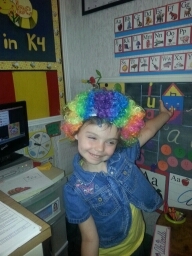 It was a fun “Clown Day” at school! Needless to say, these days have been far from a whirlwind. Robert Louis Stevenson said, “He who sows hurry reaps indigestion.” Sometimes we have to hurry, but glad we didn’t hurry with school preparation. It has already paid off – no indigestion here! Loved watching “our class” act out the Gingerbread boy story, and even more fun doing it ourselves afterwards! 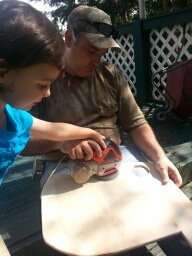 To top off this great week, AbiNoelle helped Daddy make a new, bigger tabletop for her school desk!